X-Doria has a complete line of cases for iPhones and other smartphones, and their latest protective series is the Defense Metal Series for iPhone 6 and 6 Plus, consisting of a bumper called the Defense Gear (US$39.99) and a case called the Defense Shield ($49.99). Today we're taking a look at both of these new lightweight aluminum products for your favorite new iPhone. Note that as of publication time, X-Doria had not updated its website to include this series. 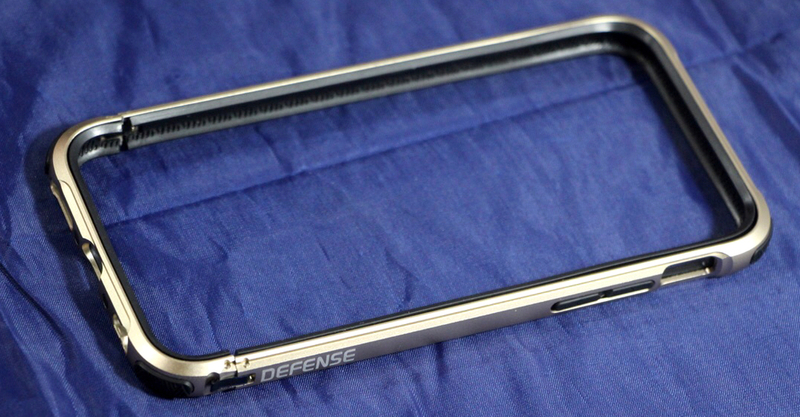 Defense Gear is an aluminum bumper for your iPhone 6 or 6 Plus. As such, it offers no protection for the front or back of your device other than a raised lip to provide protection against flat drops. If the iPhone and bumper is dropped onto the edges that are protected by Defense Gear, you're in luck -- it exceeds MIL-STD-810G for drops, meaning that it is certified to survive 6.6 foot (2 meter) drops onto concrete. That protection weighs a feather-like 0.7 ounces (19.8 grams). Defense Gear comes in three finishes: silver, gold and ... no, not Space Gray, but red. The entire frame is machined from a block of aluminum, but there's no metal-to-phone contact to scratch your iPhone. Instead, there's a soft rubber lining inside the aluminum. Installation is easy; there's a tiny latch on one side and a hinge on the other. 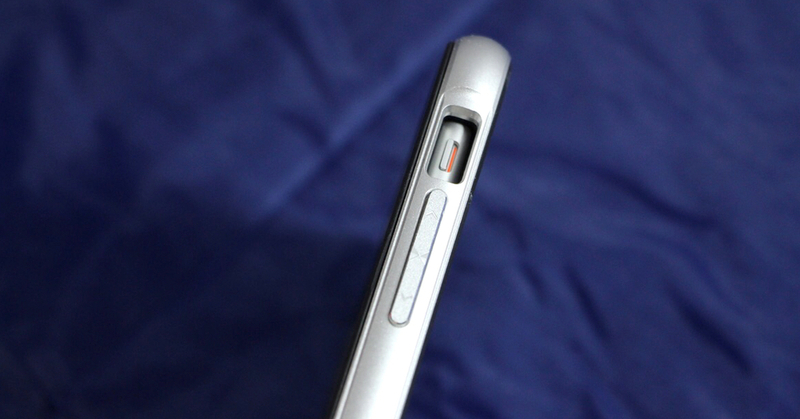 When the latch is opened, the bottom swings open to allow insertion of the iPhone. Once it is in place, you swing the bottom around and latch it on. The four corners of the bumper are given extra protection with a small protruding rubber piece, while the buttons get a similar treatment. The great thing about the Defense Gear bumper is that it's remarkably inexpensive compared to some much more pricy aluminum bumpers by other manufacturers. Defense Shield is a true case for the iPhone 6 and 6 Plus. Take the solid aluminum bumper of the Defense Gear, add a hard clear polycarbonate back shield and soft removable rubber lining, and you have the Defense Shield. It also comes in the same three finishes: silver, gold and red. 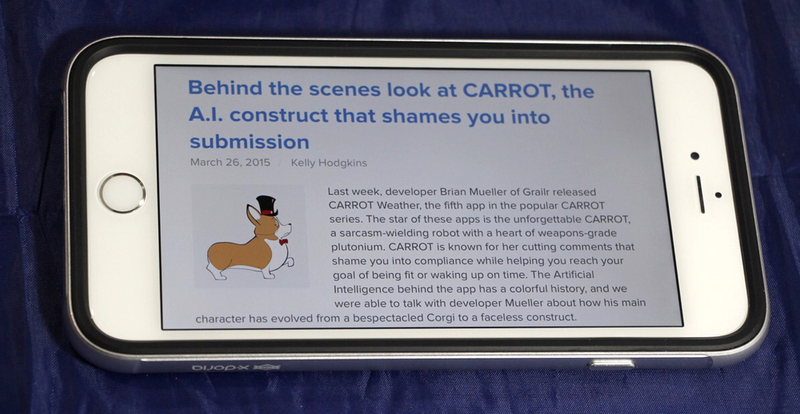 The case weighs in at only 1.8 ounces (51 grams). Installation of Defense Shield is rather simple: first, you remove the rubber case from the inside of the aluminum bumper by pivoting and popping it out. Next, grab your iPhone and put it into the rubber case -- this takes no time at all, although if you're like me you'll find that you accidentally trapped some cat hair and dust behind the clear back shield that you'll want to clean up before permanently installing the case. Finally, you place the phone/case onto a flat surface, grab the aluminum frame, and press it down onto the case until it snaps into place. Done! If you decide to take the Defense Shield off for cleaning, you just reverse the process -- take the frame off, then slide the phone out of the rubber case. The Defense Shield also exceeds MIL-STD-810G and can protect your iPhone from those nasty 6.6 foot (2 meter) drops onto concrete. However, the fact that there's a much deeper lip around the front screen and the back of the phone is almost completely encased in clear polycarbonate (there's a "window" for the camera and flash) gives it an extra level of protection. Like the Defense Gear, the X-Doria Defense Shield is less expensive than similar cases from other manufacturers. Add in the sleek design and ease of installation/removal, and the Defense Shield gets an Apple World Today five star rating.